As the self proclaimed Godfather of Windwalker Expeditions Bill has been a guide since it’s inception. He started riding as a young boy on the farm and it just became a way of life. 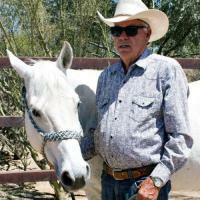 Later on, he purchased a racing Quarter horse named Joe Tee who had a proven track record. From the Joe Tee stock Bill and his family began breeding and training some of the top barrel racing horses in the country. Setem up Joe was one of these horses, he was named Professional Rodeo Association horse of the year and a four time champion at the Quarterrama Sweepstakes in Toronto, Canada. Bill’s horse expertise and life experiences have shaped who he is today. His laid back character, his witful insight and sense of humor are sure to touch all of those who find themselves in his company.